Interviews with Peyvand Khorsandi and Elham Jazab, who will be performing at the Iranian.com Norooz show in Berkeley on March 16. Cartoonist Saman will also talk about, and present a slide show, of his latest caroons. Q: Is this your first performance in the U.S.? No, in summer 1999 I started “How to be Iranian” with my sister Shappi at the LA Cabaret in Encino. We performed each Sunday for nine weeks. It is now a sushi bar. This is my general disposition, so before a major gig it&apos;s just more of a familiar feeling. 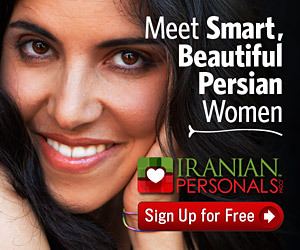 Q: What adjustments do you think you have to make to appeal to Iranians here? English words like “mini-cab” worry me. Will they know I am referring to taxis or will they think it&apos;s a rare species of bird?? Q: What attracted you to being a comedian? Obviously your father is an influence. But what convinced you that this is what you wanted to do? And what differences do you see in your style/approach to his? Abbas Kiarosatami once said that film-making chose him rather than vice versa. Film-making didn&apos;t choose me, comedy did. I don&apos;t know what influence Kiarostami&apos;s dad had on him. Q: When you prepare your material, do you always have a political/moral message in mind? Or do you focus more on entertainment with or without a message? No, something will grab my attention, like two Chinooks are downed, U.S. soldiers are killed and, hey, the war is back! Q: In the past year or so, I have heard the names of at least four Iranian standup comedians who perform in English. Why this sudden surge? Britain&apos;s Omid Djalili is the first and most accomplished. Shappi Khorsandi is now a familiar name on London&apos;s comedy circuit. I doubt there&apos;s a “surge”. Most Iranians are still in proper jobs. Q: Are immigrant Iranian kids all grown up now and making fun of their community with all its contradictions? inspiration. The chemistry between those Black performers and their audience is phenomenal. Q: Who&apos;s your favorite comedian? Q: What is the best joke you&apos;ve ever heard? “It&apos;s time to bomb Iraq.” We never stopped bombing Iraq. Q: When did you first realize that you want to be a comedian? When did you first start? What was your first performance like? Okay… well my background is in acting, that&apos;s what I studied and I would say that it&apos;s my first love, comic acting. But my comedy came about as a result of my background as a performance artist in Chicago, writing my own material and performing certain characters with different names, backgrounds etc. Q: What is it about our Iranian/American culture that generates material for your performances? Is it the clash between traditional and modern values? And the sense of being the “other” (immigrants) in a new land? I&apos;d have to say that my material right now comes from my experiences with everyday life and with Persians as I did not grow up around Iranians. We left Iran when I was a baby, and I visited once. I feel American. I&apos;ve never felt different or unusual, maybe in the south a little because my name was weird compared to everyone else&apos;s but that&apos;s it. I feel more as if I&apos;m a visitor in Persian culture than American culture primarily because I identify so clearly with American/Western culture but also with European culture and having lived in Africa, with ethnic cultures there. I feel very international in many ways because I look as if I CAN be from different cultures and blend well with a variety of different cultures. Q: Do you see any difference between your approach and those of American comedians? The difference between me and other American comedians? I dunno, I&apos;m Persian by heritage so I can have a totally different take. I can do the ethnic thing, that&apos;s not available to the typical comedian, and I can make it be my thing. Q: What is your favorite joke? My favorite or best joke of recent times? Two peanuts were walking down a dark alley. One was assaulted. (It&apos;s a pun, I love puns). Edited samples of Saman&apos;s cartoons which will for the first time be shown at the Norooz show. Saman will be there in person to talk about his work.